DES MOINES, Iowa, May 6, 2011 (ENS) – Iowa legislators passed a measure this week that gives the farming state one of the strongest biodiesel fuel policies in the USA. Biodiesel is a renewable fuel made from agricultural byproducts and co-products, such as soybean oil. Biodiesel can be used in conventional diesel engines, directly substituting for or extending supplies of petroleum diesel. Congress renewed the industry’s $1 per gallon tax deduction last year. Oil companies are required to use 800 million gallons this year and one billion gallons in 2012. The result has been a resumption of production, idled last year, at most of Iowa’s 15 biodiesel plants. Iowa’s biodiesel production capacity is about 300 million gallons, and states with the most supportive policies are expected to capture the largest share of the market. The Iowa Biodiesel Board, an industry association, applauded the bill passed by the state House Wednesday. The legislation creates a system that incentivizes local production, encourages availability of biodiesel at the pump, and invests in the infrastructure needed for wide distribution. “This is legislation that truly makes Iowa biodiesel competitive in the national marketplace, and I commend our legislators for empowering our state’s industry,” said Randy Olson, executive director of the Iowa Biodiesel Board. The House Wednesday approved legislation that the Iowa Senate passed on Monday by a vote of 48-1. The bill now goes to Governor Terry Branstad for his signature. Based on his stated support for biodiesel in the past, Governor Branstad is expected to sign the bill into law. Several of the state’s 15 biodiesel plants are experiencing an uptick in sales this year as a result of federal energy policies that have created a strong market for biodiesel. However, not all of the state’s biodiesel plants have experienced the same turnaround, and some are still struggling to survive. Other states like Illinois, Pennsylvania, and Minnesota stand to capture a majority of the national biodiesel market. Those states have requirements, tax exemptions and producer credits that make their state biodiesel industries highly competitive. Olson urged Governor Branstad to sign the legislation. “Putting biodiesel producers back to work is good for the state’s economy, and also will help make Iowa the renewable energy capital of the world in the face of rising oil prices,” he said. The renewable energy bill, Senate File 531, will extend the Iowa biodiesel retailer credit through 2017 and make it easier for petroleum marketers to achieve the credit. The bill adds a biodiesel producer incentive starting in 2012 and provides $3 million a year to the Renewable Fuels Infrastructure Board, a state agency. Compared with burning petroleum diesel, using biodiesel in a conventional diesel engine substantially reduces emissions of unburned hydrocarbons, carbon monoxide, sulfates, polycyclic aromatic hydrocarbons, nitrated polycyclic aromatic hydrocarbons, and particulate matter, according to the U.S. Department of Energy. 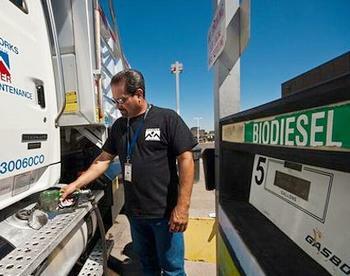 The reductions increase as the amount of biodiesel blended into diesel fuel increases. B100, or 100 percent biodiesel, provides the best emission reductions, but lower-level blends also provide benefits.